I visited New Zealand in early 2014 and traveled right around the South island, this is one of a series of New Zealand paintings inspired by my adventures. Mount Cook ( Aoraki ) is the sharp peak on the right, and is the highest mountain in New Zealand, reaching 3,724 metres (12,218 ft). On this particular day, snow-capped and with crystal blue skies, it looked magnificent. 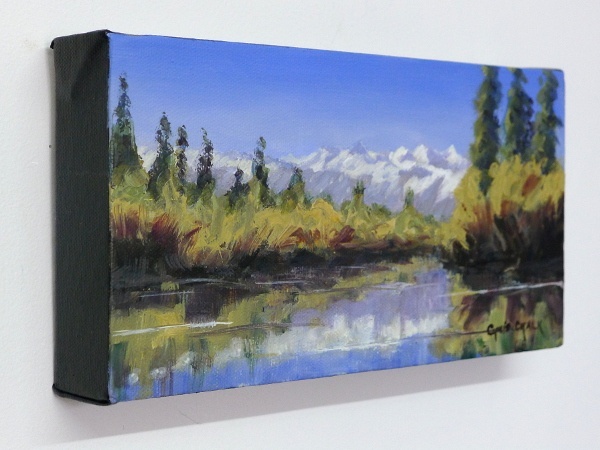 "Mount Cook and the Southern Alps, New Zealand"
Oil on box canvas 10" by 5"
Painted on box canvas and with the sides of the canvas painted black, this little treasure doesn't need a frame and is ready to hang.